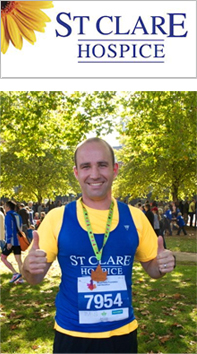 On October 7th 2012 Andrew raised an impressive £545 for St Clare Hospice in the London Royal Parks Half Marathon. It was a superb effort for a fantastic cause and we look forward to our next event. Since the beginning of 2011, we’ve been supporting St Clare Hospice in Harlow by providing its feminine hygiene and washroom service at no cost. As we’re committed to supporting local charities, we’re proud to be supporting the Hospice, which provides an invaluable service by caring for the people of West Essex and the Hertfordshire Border. Our Director Samantha Shelley comments: “At Simply Washrooms we feel strongly about supporting local charities and we’re delighted to be working in partnership with St Clare Hospice. “Through its provision of free palliative care for patients, families and friends, the Hospice is an integral part of our community.